I believe in one God, the Father almighty, Maker of heaven and earth, and of all things visible and invisible. And in one Lord, Jesus Christ, the only-begotten Son of God. Born of the Father before all ages. God of God, light of light, true God of true God. Begotten, not made; of one being with the Father, by whom all things were made. Who for us men, and for our salvation, come down from heaven. He was also crucified for us, suffered under Pontius Pilate, and was buried. And on the third day He arose again, according to the Scriptures. And ascending into heaven, He sitteth at the right hand of the Father. And He shall come again with glory to judge the living and the dead; and of His kingdom there shall be no end. And in the Holy Ghost, the Lord and Giver of life, Who proceedeth from the Father and the Son. Who together with the Father and the Son is no less adored and glorified, Who spoke by the prophets. And in one, holy, catholic, and apostolic Church. I confess one baptism for the remission of sins. And I look for the resurrection of the dead. And the life of the world to come. Amen. 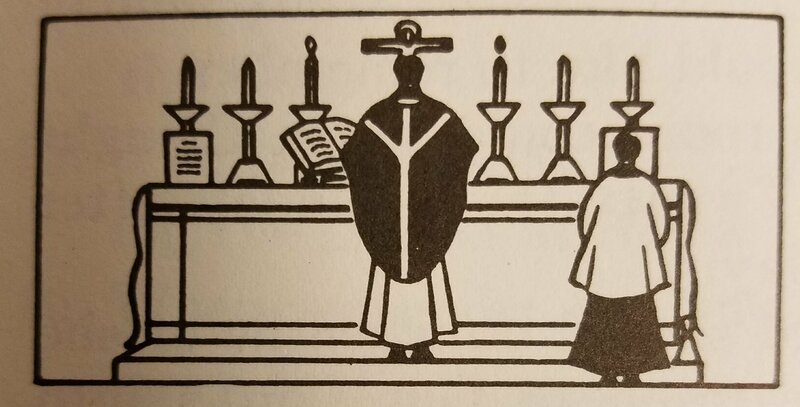 On Sundays and special feasts, the priest makes the beautiful act of faith called the Credo or Creed. He does so immediately after the Gospel, or after the sermon, if there is one. The people stand as the priest recites the Creed. The word Credo, with which the Creed begins in Latin, means “I believe.” The people have an opportunity to recite the Creed at the same time the priest does. The way a person does so shows how he feels about the things he believes. When you recite the Creed, silently or aloud, you are putting into words some of the things you believe. In a way, you are making known publicly what you believe. You do this not only by reciting the Creed, but also by standing. To stand is a special mark of respect. The Creed which is recited in the Mass is called the Nicene Creed. When you were in second or third grade, you learned the Apostles’ Creed. You know that the first part of the Catechism explains the Apostles’ Creed. Just as the Apostles’ Creed is a summary of the things we believe, so, too, is the Nicene Creed. The Nicene Creed has more to say about the Second Person of the Blessed Trinity than the Apostles’ Creed. The Nicene Creed was first written in 325. At that time there were people who said that Christ was not the Son of God. 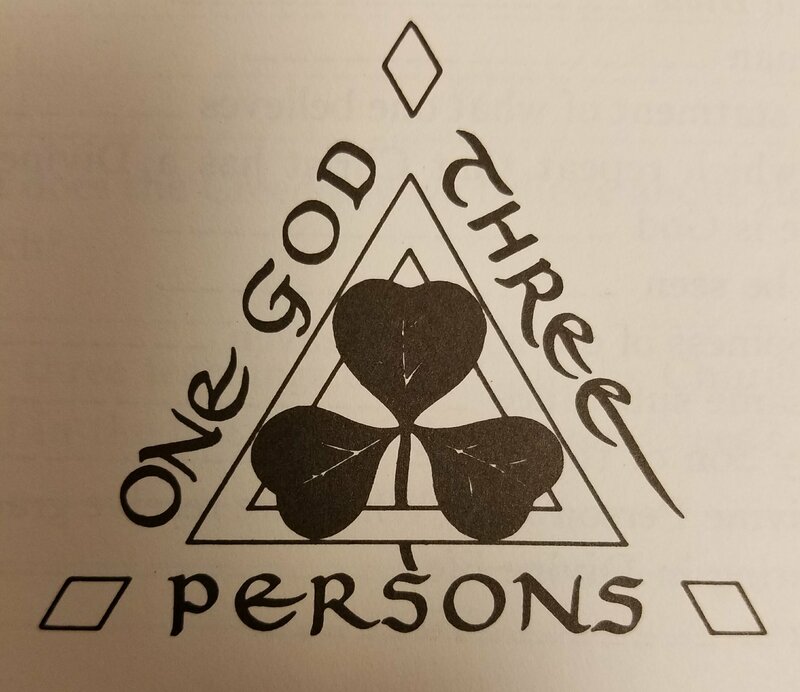 It is for this reason that the Nicene Creed has so much to say about the Second Person of the Blessed Trinity, the Son of God, Who is equal to the Father and the Holy Ghost in all things. As the priest recites the Creed in the Mass, he kneels at those words that tell about the Son of God becoming man. At this time, we also kneel to adore the Second Person of the Blessed Trinity. In the Creed we tell, one after the other, some of the things we believe about God, about the Father, about the Son, about the Holy Ghost, and about the Church.